Carolers, Hot Cider, Tree Trimming, Horse Carriage Rides, a Live Nativity Scene and a Parade! 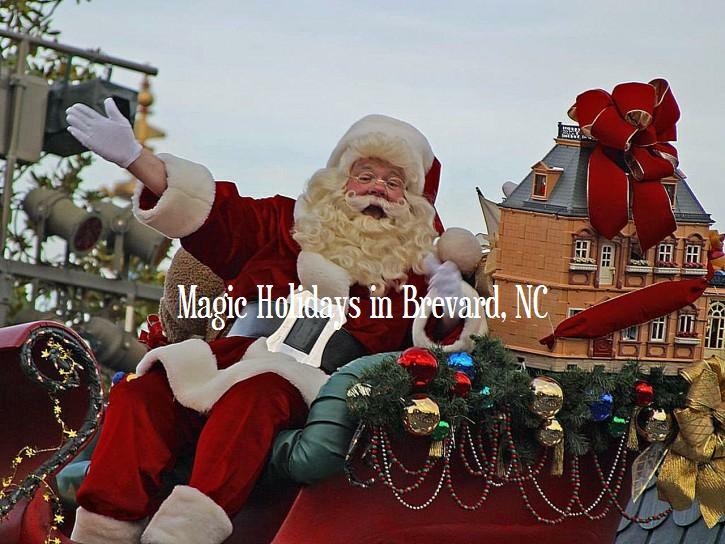 The Holidays will soon be upon us and everyone up in Brevard, North Carolina is getting ready for the fun to begin! Even the white squirrels are wishing for wintry accumulation, as the weather man makes promises of snowy forecast in the Blue Ridge Mountains this winter, and all fingers are crossed in hopes of a White Christmas! Downtown on Main Street, signs of holly and ivy have sprung up in various storefront windows. At least a dozen Christmas lists had been written and rewritten in the toy-filled aisles of O.P. Taylor’s. Local artists and craftspeople have produced an impressive array of handcrafted gifts and ornaments. And fans of the fir may not need to travel far to sing “O Tannenbaum” to a tree of Transylvania provenance. No matter your favorite flavor of candy cane, Transylvania County will summon visions of sugarplums this time of year. Bring your shopping list, your holiday spirit and a warm jacket (it gets cold at the higher altitudes) and have yourself the happiest of holidays and the most joyous of New Years.